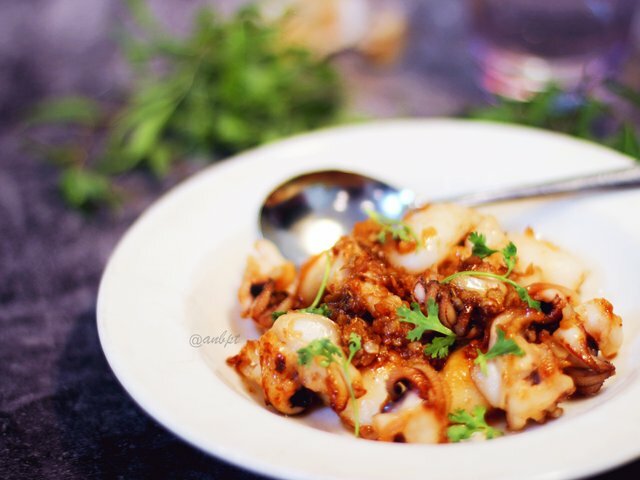 Braised squid with fish sauce recipe. 4 cloves garlic (finely chopped). 1 ginger (cut into julienne). Fish sauce, sugar and vegetable oil. Wash the squid well after removing inedible portions and cut the squid in large pieces. Drain it and set aside. Heat vegetable oil in the pan over medium low heat, add the squids and fry well on the both side until golden. Then add garlic and ginger, fry well until golden. Meanwhile, prepare sauce: In the bowl, add 2 tablespoons fish sauce, 2 teaspoons sugar and mix well. When the squids is cooked, add prepared sauce and fry-stir well for a minutes. Arrange the squid in a bowl, garnish with coriander if you want. I love the presentation also. awesum! Uhhh, how delicious is this recipe. What you offer in your Steemit resturant is always something f good and tasty. What a delicious food that is. Everything you put on is exquisite. That recipe seems to be so delicious and yummy.. Delicious!! Thanks for sharing. If you like fish, check my last recipe: Healthy salmon with sautéed vegetables and avocado hummus.